* We're well on the way to getting more than 10,000 signatures on the petition. Thanks to everyone and all the local shops and clubs who are helping out. * The Department of Premier and Cabinet has taken charge of organising the independent review of Origin's risk report which the Office of Sport based its decision on. * The Office of Sport has agreed that there will be no demolition work on the existing centre for two years. Computers and other valuable equipment are being removed from the site but the actual buildings and all of its facilities will remain untouched for two years, or until we can get the doors reopened. * Origin Energy has again committed to funding any rebuild or relocation of the Sport and Recreation centre if required. If that was to happen, I'll be pushing for the existing site to be protected as a State or national park. * My thanks to the Year 2 kids at Waratah Public School for sending me all these fantastic posters and letters. 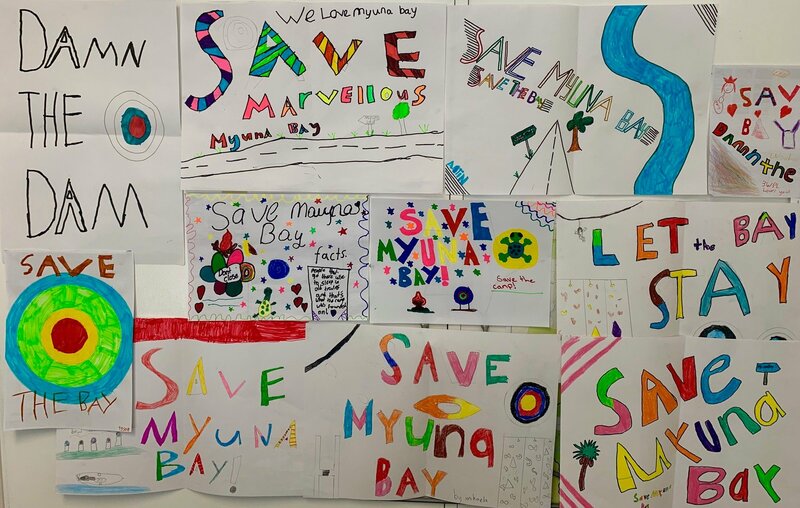 Sadly, they've had to cancel their planned camp at Myuna Bay, but it's so good to see them campaigning for the centre's reopening. Well done kids!